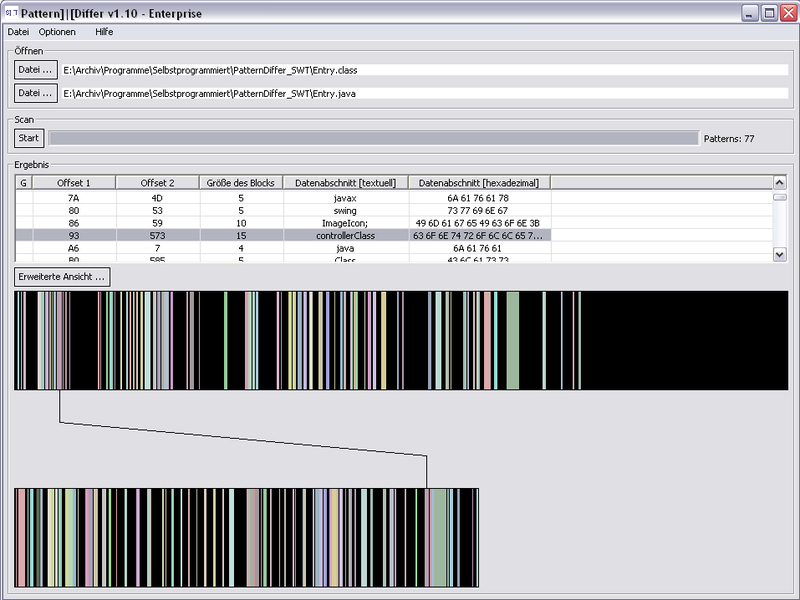 With PatterDiffer you have got the possibility to find equal data sequences in two different files. You can see the result in a tabular display with textual and hexadecimal view. The result can be exported to a XML-File for further automated processes. Since the data is analysed on a binary level its structure is not important for the analysis. Simplified you can say that PatternDiffer analyses of the largest connected sequences of two file. ...... Simplified you can say that PatternDiffer analyses of the largest connected sequences of two file. The algorithm searches the both data structures for equal sequences. The number of different sequence possibilities is rather high. The runtime of the analysis is O(n) = n. Always the first optimal solution will be shown. Other solutions will not be processed. Restrictions like "Igonore Binary Zero" or "Minimal sequence length" fasten the analysis. Qweas is providing links to PatternDiffer 1.2 as a courtesy, and makes no representations regarding PatternDiffer or any other applications or any information related thereto. Any questions, complaints or claims regarding this application PatternDiffer 1.2 must be directed to the appropriate software vendor. You may click the publisher link of PatternDiffer on the top of this page to get more details about the vendor.